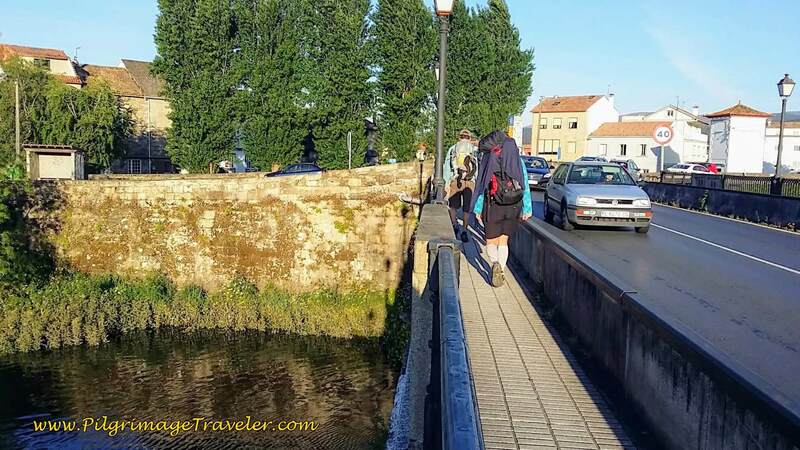 Our day twenty-four on the Camino Portugués was long, yet beautiful and enjoyable, meandering back and forth along the path of the N-550. 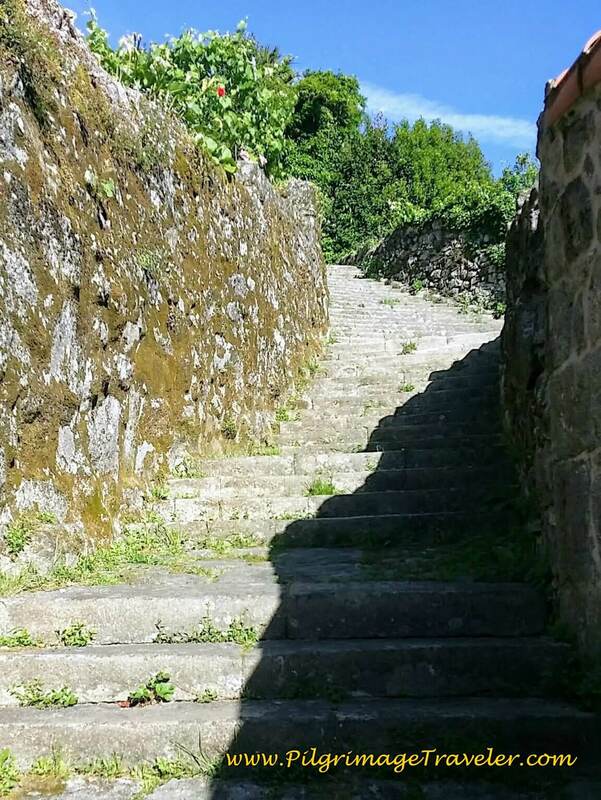 I did not have the same angst as I did the prior day, but realized I needed to enjoy this time, as our Camino was coming very near to its close. 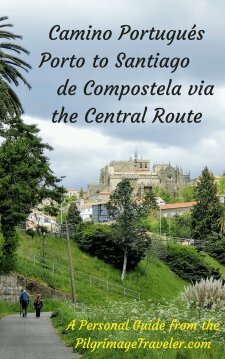 You could probably take about two kilometers off this day, as I measured the backtracking that we had to do when we got lost trying to get to the Santiaguiño do Monte in Padrón and the extra kilometer to do the round trip up the mountain. 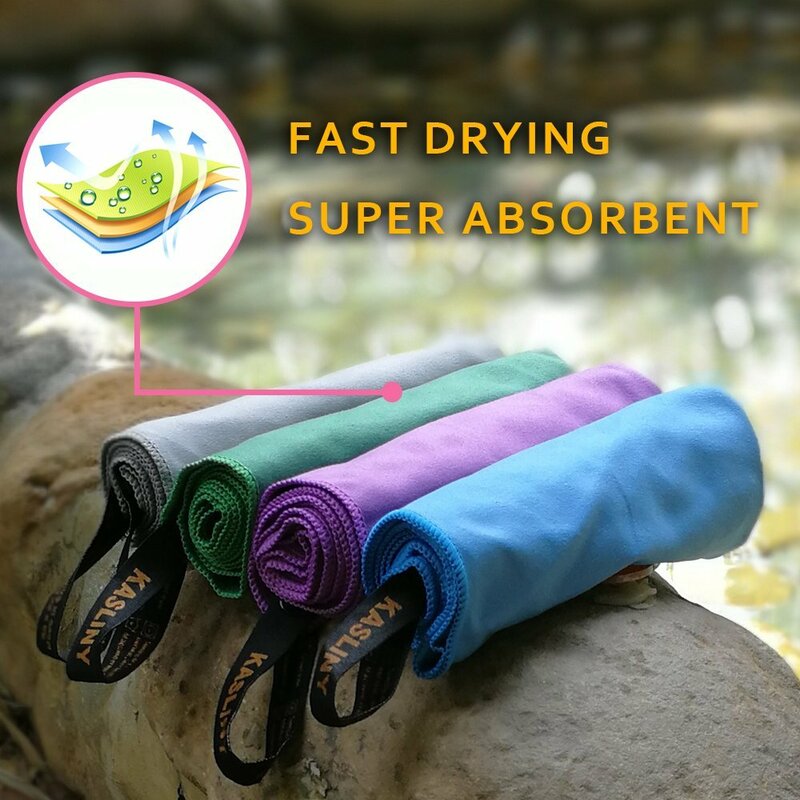 See farther below for the details. Today was most definitely the day to take it slow, be present to the experience, hold it dear in our hearts and keep the mystery going! My google map of the day is here, showing plenty of services, some larger towns and many more pilgrims, being so close to Santiago de Compostela. I placed only albergues on the map and the cafés where we stopped. 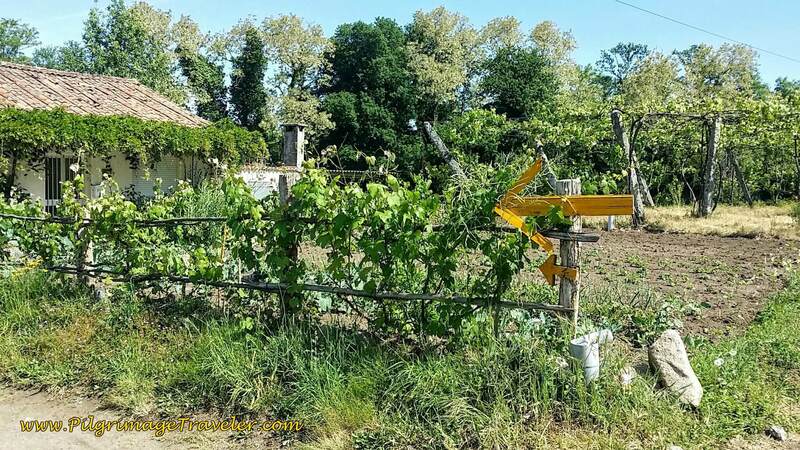 For a complete list of accommodations, click here, for a pilgrim-maintained list, started by a devoted gentleman by the name of Christian Pfeiffer Jensen. I and others have also contibuted to this effort! It is all downhill for the first part of the day to the River in Padrón and then a long, steady climb uphill to Milladoiro. The gain is 250 meters (830 feet) but because it was over 18 kilometers (11.5 miles) I never really minded it. We left the Albergue de Valga with full bellies, as we were able to cook our own breakfast from the groceries we had bought the day before. It is always a good start for me when I have a good breakfast. 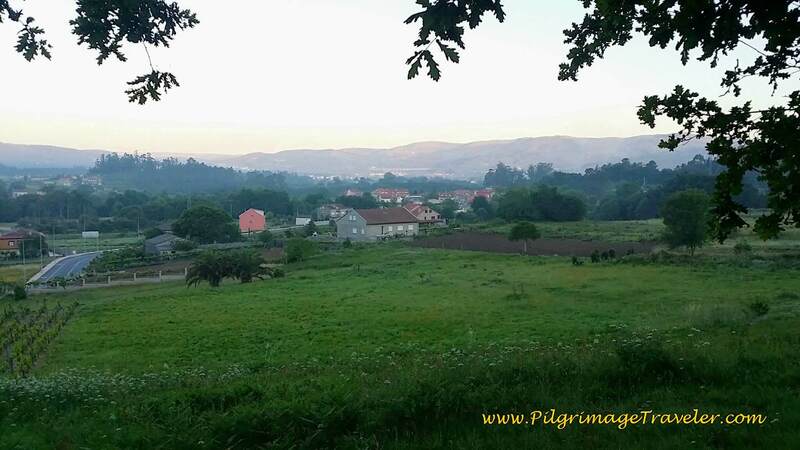 The Camino Portugués starts out downhill, on day twenty-four, and it was a lovely, fresh morning. We joined the dirt path we had left on day twenty-three and very soon came upon this 32 km waymark. It is a nice walk through the forest to start the day. This Galician moss-covered forest was so typical. I breathed it in! 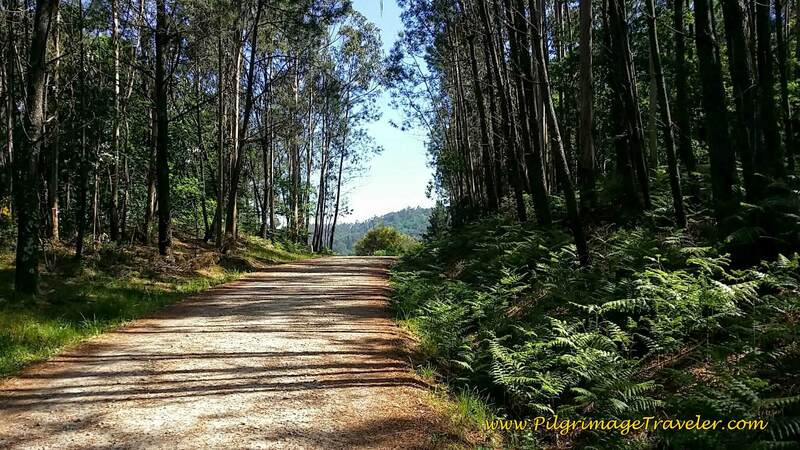 When the forests look like this, I know we are getting close to Santiago! 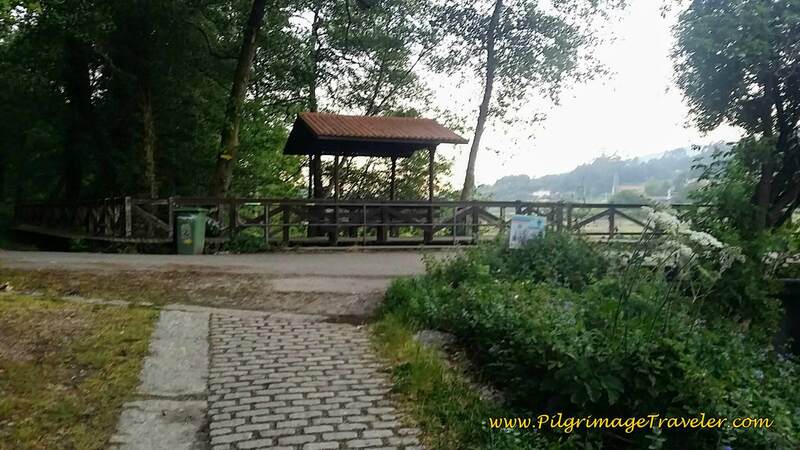 The forest path continues for a total of 1.8 kilometers, then comes to a T at a paved road, at this picnic ground. The pilgrimage traveler needs to turn right here and head for San Miguel de Valga on a narrow paved road. 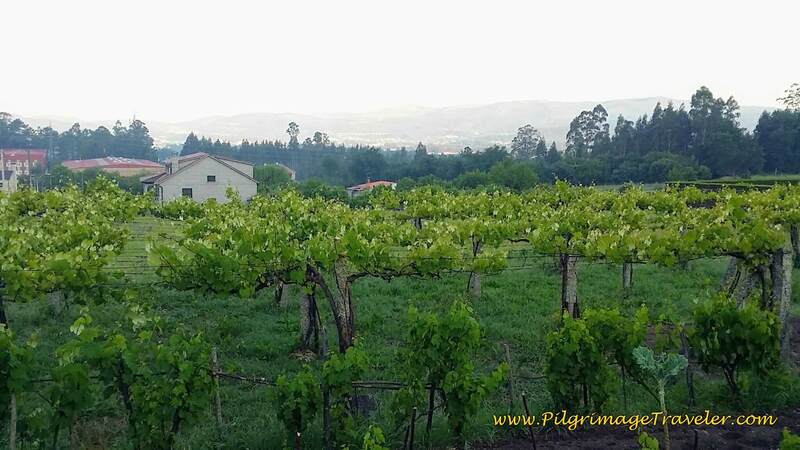 The narrow paved road passes through vineyards and walks through town and past the Iglesia San Miguel. It is a little village and in 600 meters you are through it. There is a café at an auto service center on the north side of town if you desire a stop. About 50 meters after the center, the Camino turns to the left at this intersection, pictured below, and onto a road that quickly turns into a path. The views of the countryside in the early morning, were stunning. 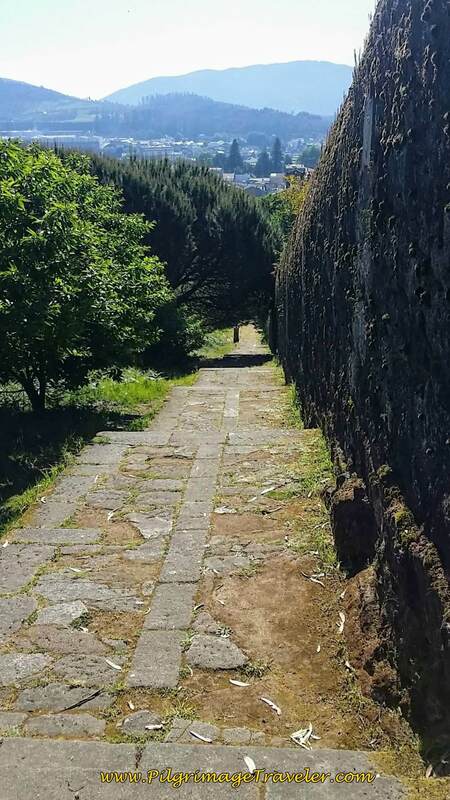 The path turns to pavement and rounds this high wall and meanders for not quite a kilometer. 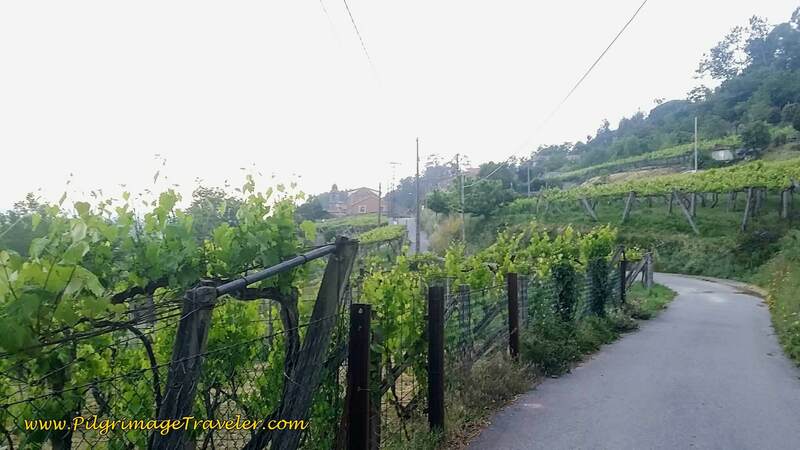 Here is a view of the Valga and the valley below, seen through the vineyards. When the road straightens out, at a full kilometer, the pavement ends and and you cross a street and start a lovely trail system on a cobblestone pathway, shown below. Here we caught up to two female German pilgrims with whom Rich chatted, as usual. The cobblestone pathway lasts for 0.8 kilometers and comes to this T-intersection with another road. We turned right here. 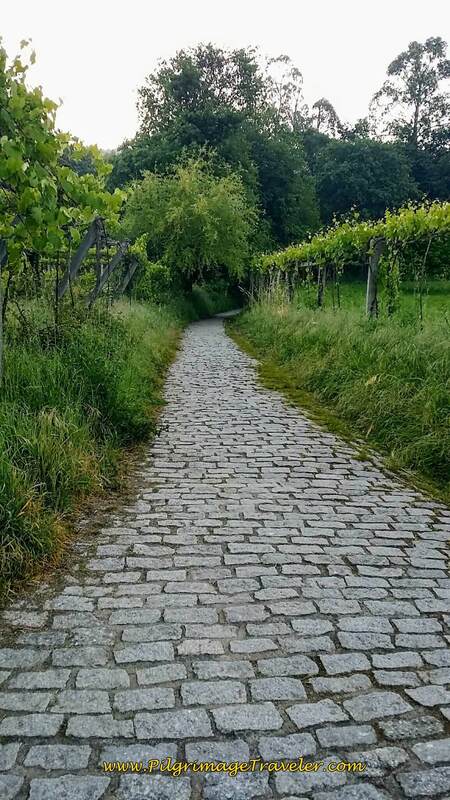 Here is a look-back at the quaint cobblestone path through the vineyards. A rare thing in Spain. For a moment I thought I was back in Portugal! 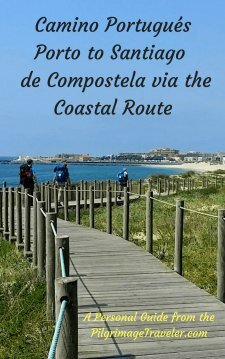 Walk about 60 meters and join the long straight Camiño Regadio for an additional one-and-a-quarter kilometers to walk into the next town of Concide. 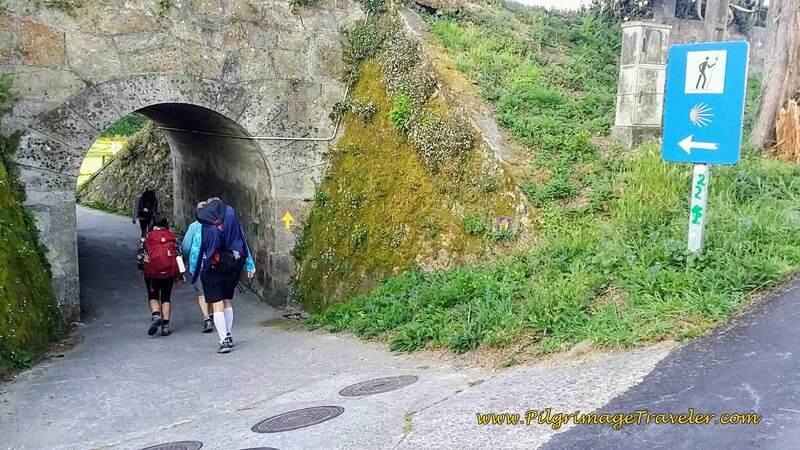 There is a sidewalk on the right side of the street, that is helpful for the pilgrimage traveler. 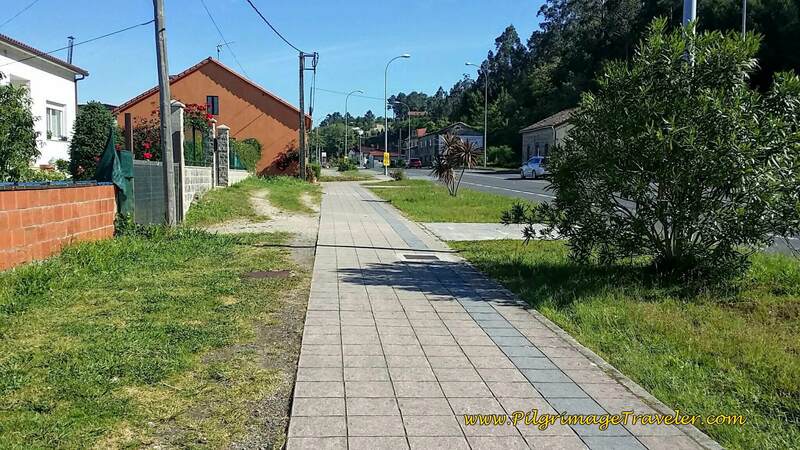 The Camiño Regadio walks into the the large urban area of Pontecesures and ends at a T-intersection. Here you turn left onto the Camiño Carreiras, for only about 75 meters, then right to join the Rúa Real. 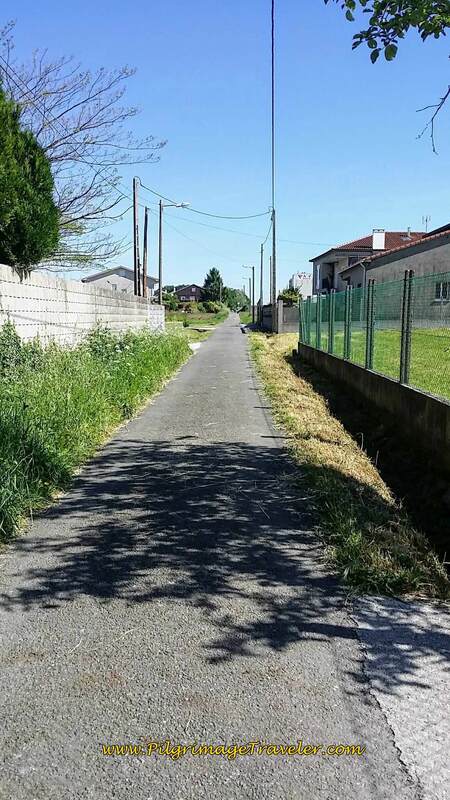 Walk 100 meters on the Rúa Real, come to an intersection with the PO-214. Cross over the Po-214 and join the Camiño Infesta. Wind around on Infesta, climbing up to a picnic area and a viewpoint. In three hundred meters come to the next intersection and walk straight on. Here, the Camiño Infesta becomes the Rúa Castro. Walk 30 meters on the Rúa Castro and drop back down the hill and to the left. In another hundred meters turn right on the Rúa do Pilar. You are now walking through the quaint and narrow streets of the old town. 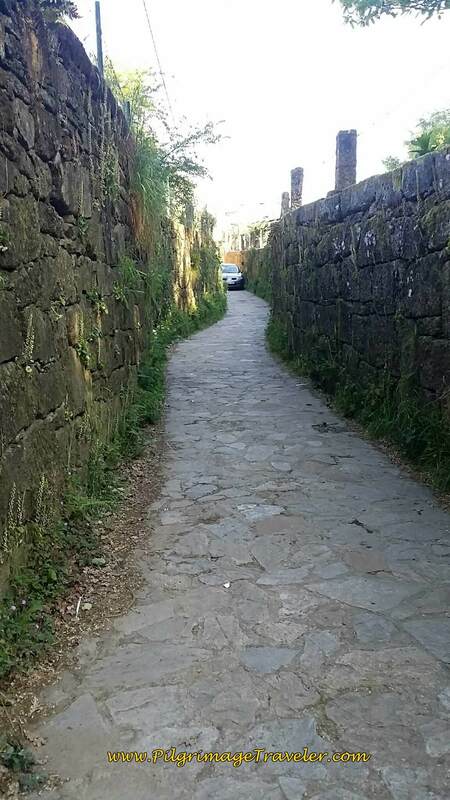 This is a narrow brick road, with high walls on each side. Walk past the Igrexa de San Xulián de Requeixo. Continue on the Rúa do Pilar, down the hill toward the river. After a total of four hundred meters, just past the church, the brick road ends. Turn left on the Rúa Cantilla. 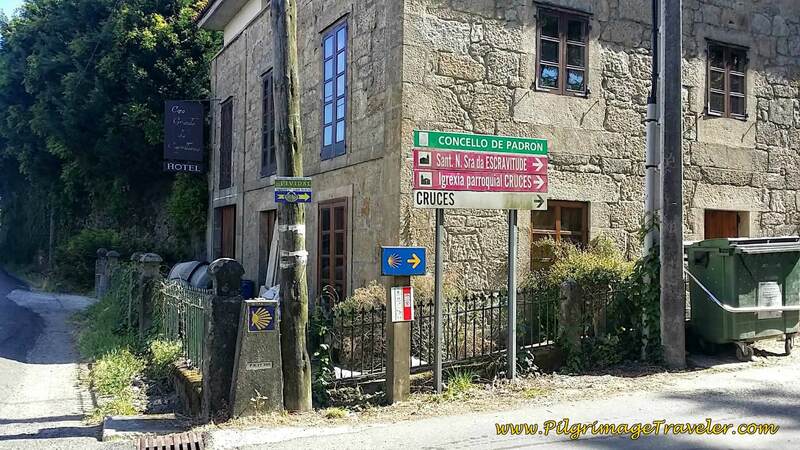 At this intersection there is an alternative route that goes to the right, if your destination is the Mosteiro and Convento de Herbón and the Albergue de Peregrinos there. Otherwise, cross the railroad tracks and walk 140 meters and turn left at this bridge, that goes under the N-550. Walk under the n-550, turn right to walk up the stairs and back up to the opposite side of the N-550. Cross the bridge over the Río Ulla to walk into Padrón. After crossing the bridge, take the second left to pick up the Ponte Aldea. Walk straight on for 1/2 kilometer, into more open areas that feels like you are leaving town. Come to a T-intersection by the River Sar. Turn right onto the riverfront road and walk north, back toward the city of Padrón. Follow the river through some industrial areas and through parking lots and finally to a nice long park that parallels the river. 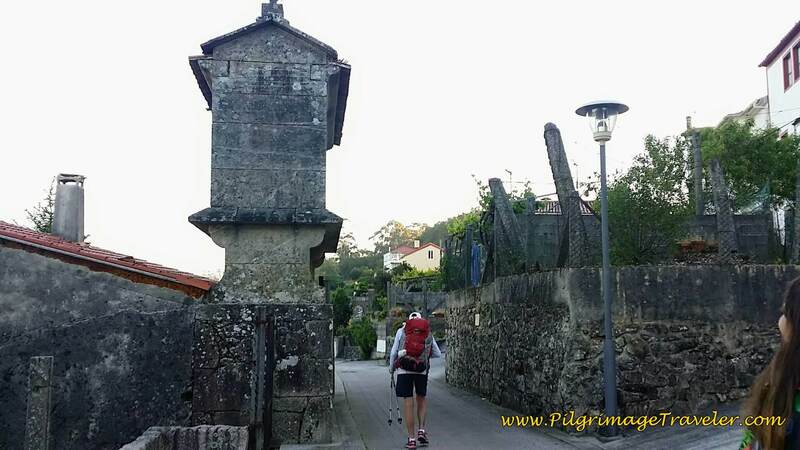 Arrive in the center of town after one-and-a-third kilometers at the Praza Cantón Igrexa, by the Church Santiago Apóstolo and a bridge crossing the river to the left. Turn right here to continue on the Camino, or left and across the bridge to take the short detour to the Santiaguiño do Monte, not even a full kilometer out of the way. 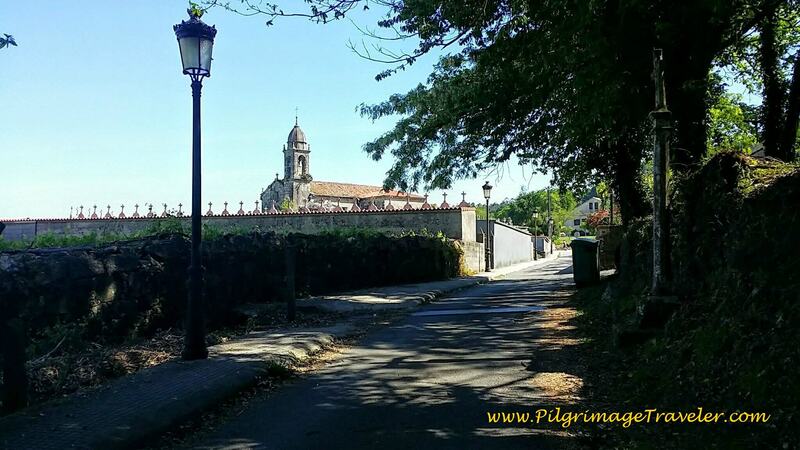 Across the bridge you will also find the Albergue de Peregrinos de Padrón, just beyond the Convento do Carme, see photo below. 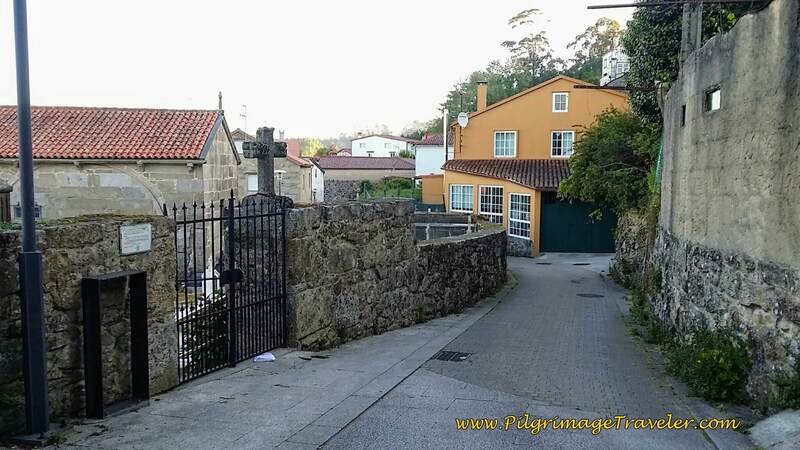 We turned right and walked around the church, turning left on the Rúa Murgadán, into the Plaza Manuel Rodríguez Cobián where the Albergue Rossol is, in the photo below. We had our 1st coffee break for day twenty-four on the Portuguese Way, here. If you come to the Albergue and Café Bar Rossol, you have missed the turn to Santiaguiño do Monte. This is what happened to us. Somehow I got disoriented and thought the turn was farther on. 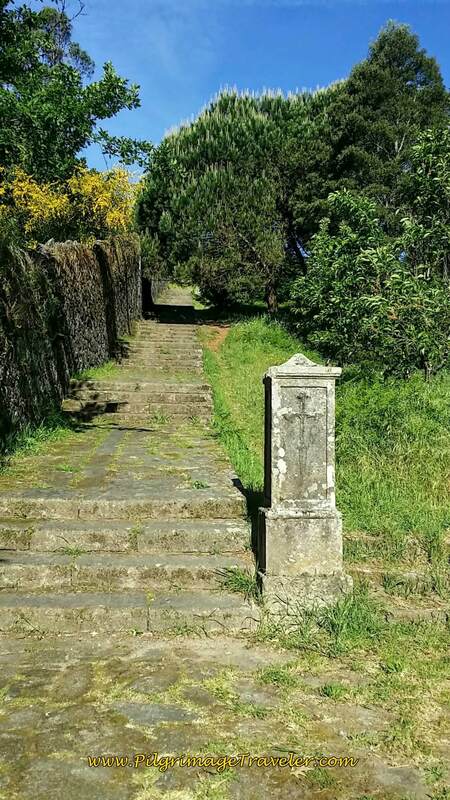 Legend says that if you go all the way to the top of the mountain, to the sanctuary, taking all 132 steps without stopping all your sins will be forgiven. 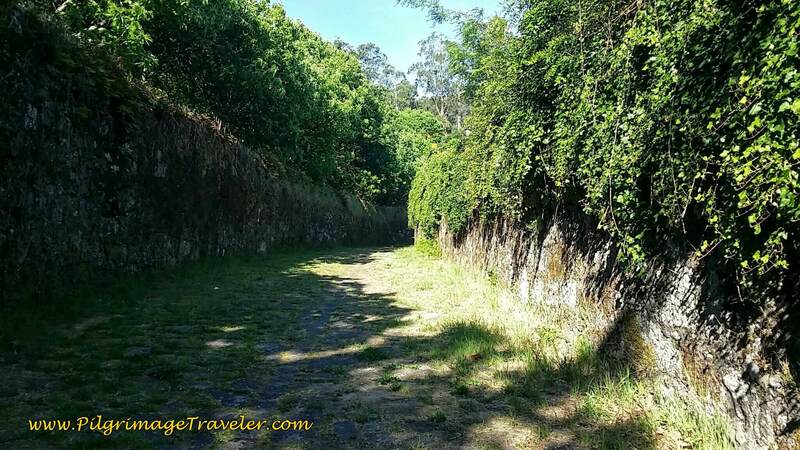 For more information on the Santiaguiño do Monte click on the link to this most historic place tracing its roots as far back as the 3rd century BCE. 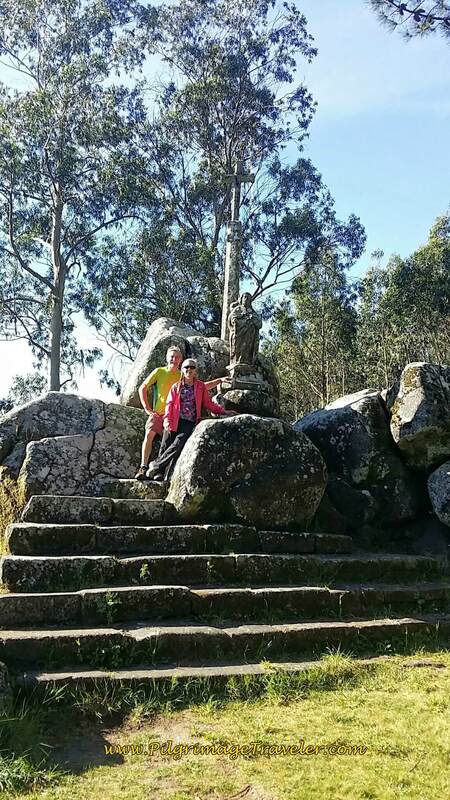 Legend also says that Santiago himself preached here and a statue of him stands beside the cruceiro at the top. The climb truly is not that difficult and less than one kilometer for the round trip. The elevation change is not even 100 meters. If you look at my elevation profile for the day, the small bump between the flat areas, in the middle of the day is the climb to the Monte. To climb the mountain, short and steep, first cross the bridge in the center of town, with the Carme Convent looming before you, shown in the photo below. Once across the Sar River, look for the fountain, the Fuente del Carmen, shown on the left. Walk to the right of the fountain and take the first right onto the Rúa Peregrinos. Walk 60 meters and look for a stairway between buildings, a "secret passageway," shown on the right. Turn left up the stairs and start your stair climbing! Keep climbing on this lovely pathway, following the wall, below. At the top, turn left to continue following the path along this wall, paralleling a road for a short ways. When you come to the car park at the end of the road, you can see the small chapel ahead, the Hermitage at Santiaguiño do Monte. I photographed the top part of the chapel only. The angle of the sun was unfavorable for a full shot of the chapel. This high relief depicts the baptism of Queen Lupa by the Apostle James. Just beyond the chapel is a disordered mound of 10 rocks, placed here for an unknown sacred purpose. 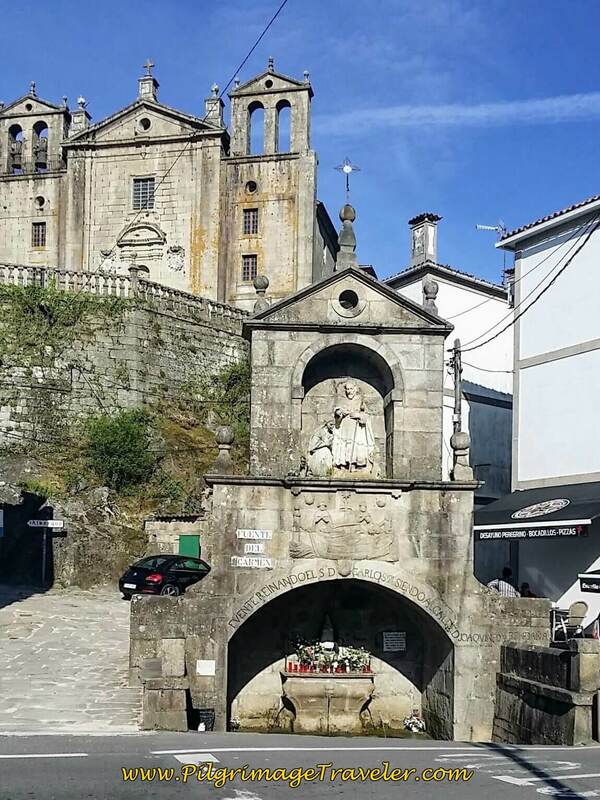 The Jacobean tradition re-invented this sacred site for Santiago and built his statue and this cruceiro on top of the rocks. We paused for photos, taken by the two German pilgrims we met earlier, and for a snack with a view over Padrón. We felt it was definitely worth the short detour to see this incredibly reverent place. 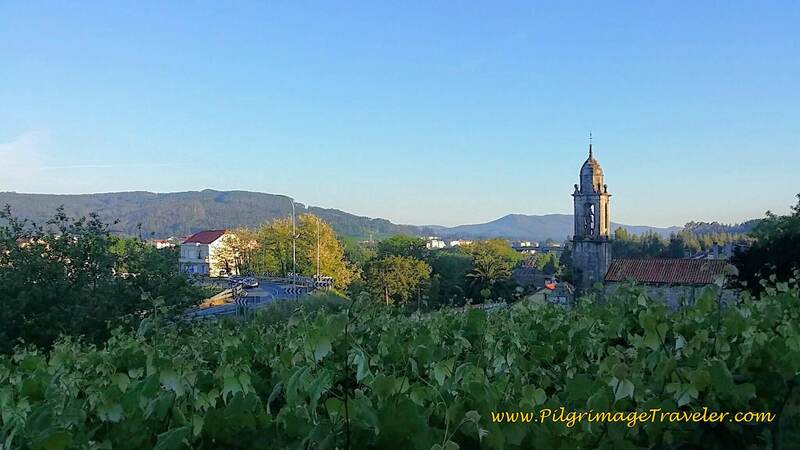 The pilgrimage traveler can definitely feel the energy and the mystery here, the destination of thousands of pilgrims over the centuries since long before Christ. Even though we believe that Grace provides us forgiveness, just for the asking, we stayed here, savoring moments of peace and mystery here on this lovely mountaintop. 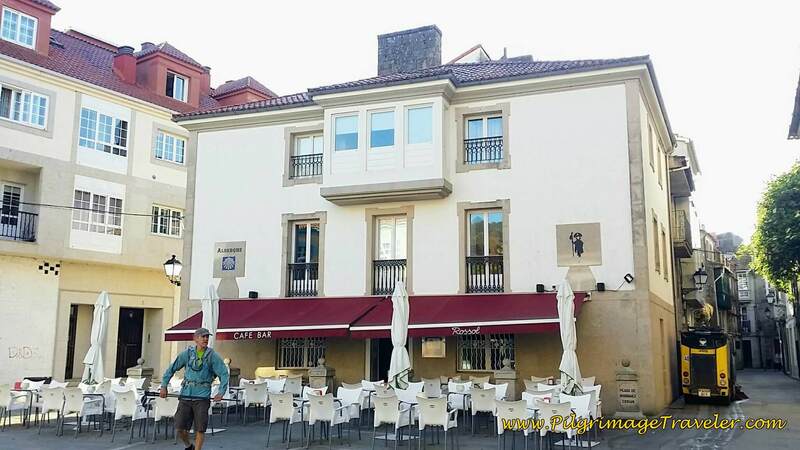 After our coffee break at the Café Bar Rossol, we walked north on the Rúa Murgadán for 60 meters, then turned right on the cobblestone street, the Rúa Corredoira da Barca, past the Albergue Corredoiras Padrón. 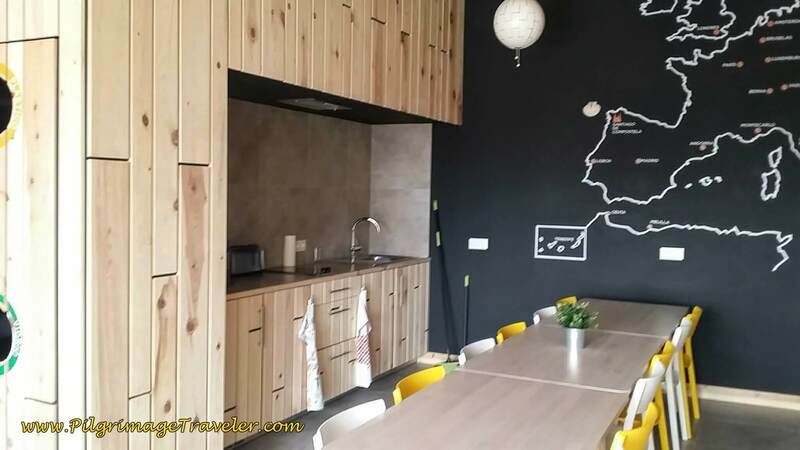 There are many more albergues and hotels in Padrón, click here to book ahead if you desire. 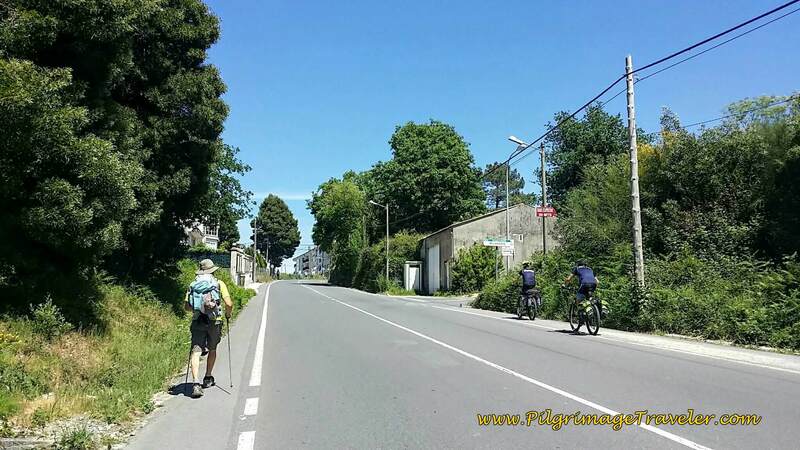 Our day twenty-four on the Camino Portugués was getting very hot. I was wearing shorts for the first time in many days. 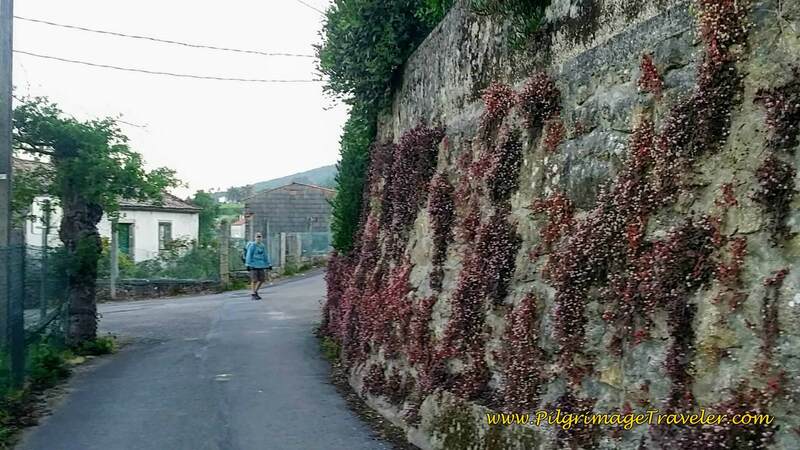 After 90 meters turn left on the narrow Rúa Dores, which becomes the Travesía Iría and the road widens as you walk through the north side of town and across the River Sar once again. Continue on straight as the street becomes very narrow for a total of 3/4 km, till you come to the N-550. 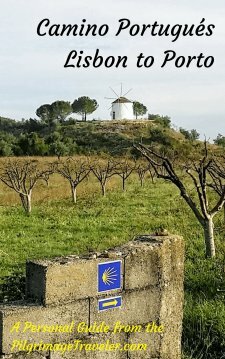 Cross over the N-550 and pick up the Lugar de Pedreda to walk by the Igrexa Santa Maria Iria Flavia. 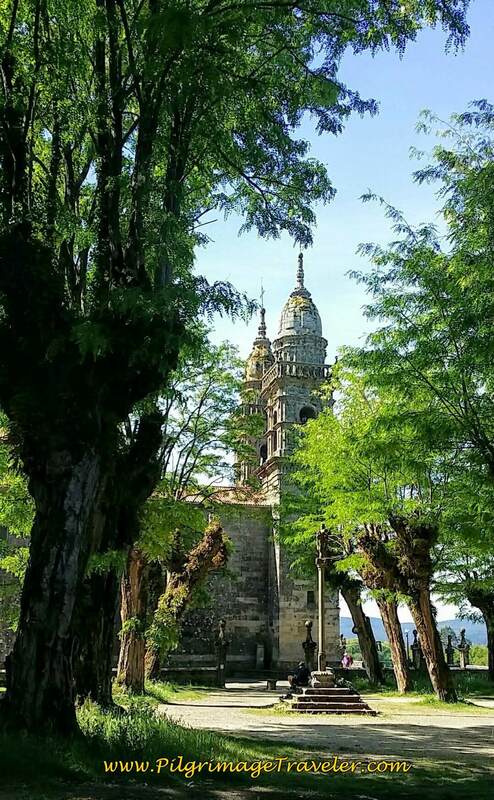 It was by this church that I realized that we had missed the Santiaguiño do Monte, so I stopped to ask a gentleman where it was. I actually understood his explanation that told me indeed, we had missed it and had to make a decision whether or not to go back to Padrón if we wanted to go there. As you know, from above, we chose to retrace our steps and go back to Padrón. You can see the retracement on my Google map above, if you zoom in. 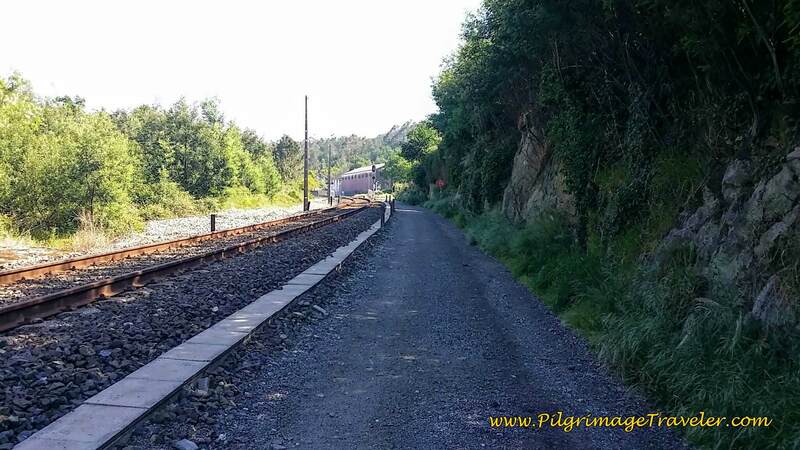 After the Santa Maria church, walk down and under the railroad tracks to continue on the Lugar de Pedreda for about 1.5 km total as it winds around, turns left and comes back out onto the N-550. Alas! the diversion off the highway was nice while it lasted. In just about a half a kilometer on the N-550, come to a large roundabout, staying left. Just beyond is a very nice sidewalk that runs parallel to the highway which is a more pleasant way to walk along the N-550. Walk on the Aldea Romarís for 300 meters, turning left onto Souro Street. 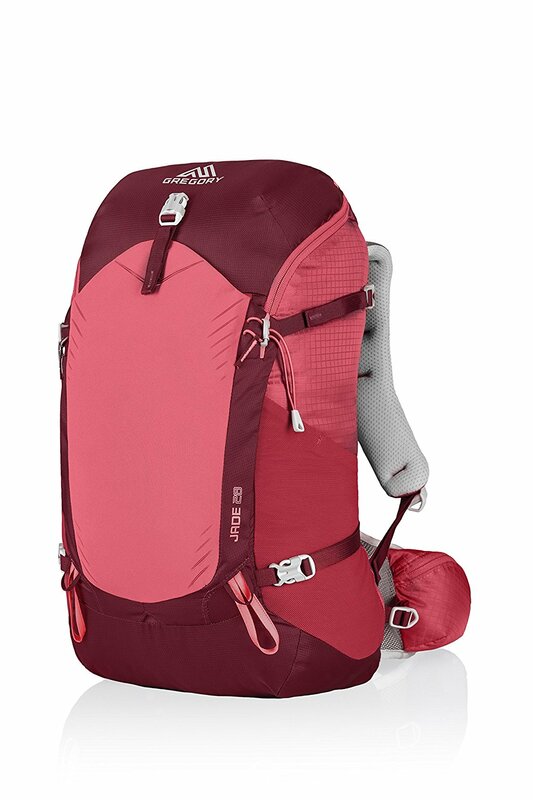 Walk a few meters more to pick up the Aldea Cambelas. This lovely narrow road winds around and through the village of Porta Dos Mariños on some amazing tracks. When this car approached us, I was not sure there was room for both of us! 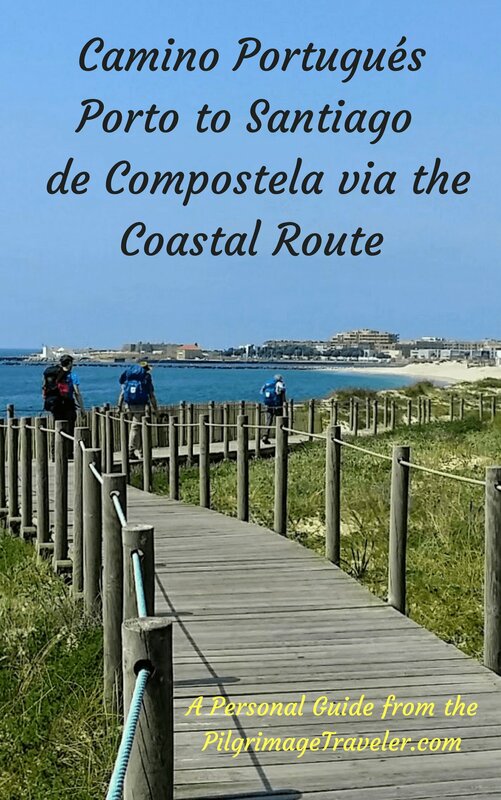 Continue on the Aldea Cambelas for a wonderful 1/2 kilometer, then turn left onto the Aldea Anteportas for a few meters, followed by a right onto Tarrío Street and toward the town of the same name. 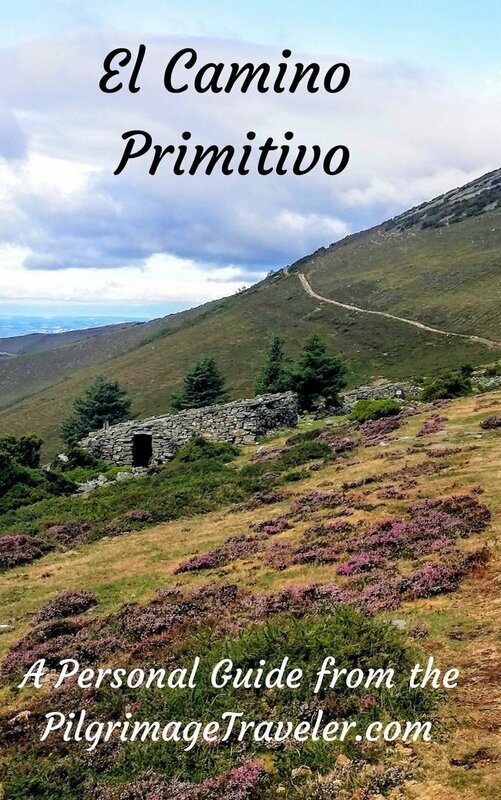 This town and the last are so attractive to walk through, with side by side hórreos, gorgeous spring flowers and almost no pilgrims around in Tarrío. Back on the N550 we had seen lot of pilgrims with small backpacks, and a van with a backpack transport service, but now we had the towns to ourselves! It was very nice! Where had all the pilgrims gone? 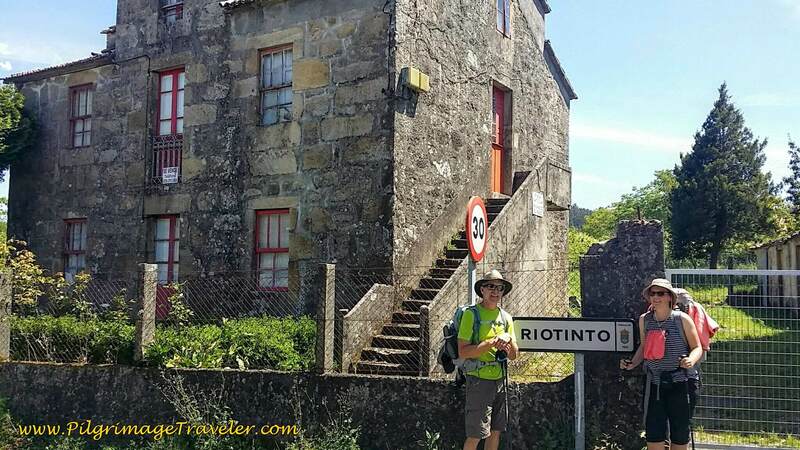 We wandered through the town and onward, on Tarrío Street for almost another full kilometer. 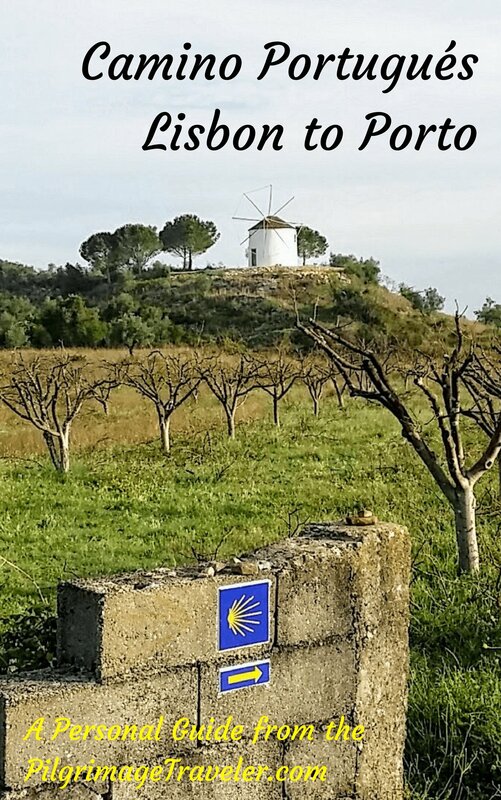 Follow the waymarks to walk another 0.85 through the next town of O Vilar. Just beyond Vilar, meet and follow the railroad tracks. Where the tracks end, meet the N-550 again, below. Walk 1/2 km on N-550, past the church the Iglesia Iria Flavia and come to this sign toward the direction of Cruces by a nice-looking hotel, the Casa Grande da Capellanía. Turn right at the above sign. 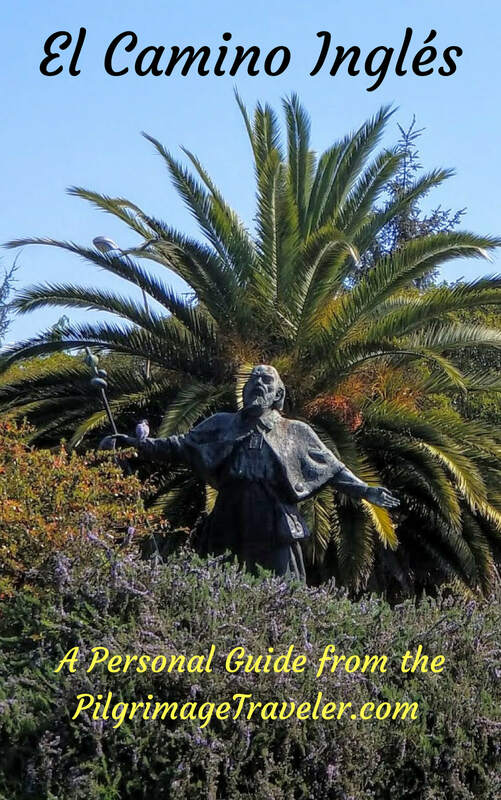 After you turn, you see the shady park of the Iglesia Iria Flavia, on the north side. You can see how in need of repair is the church, with all the moss growing on it. We stopped here to pause and get a brief reprieve from the sun before starting up the hill on the Cruces street. 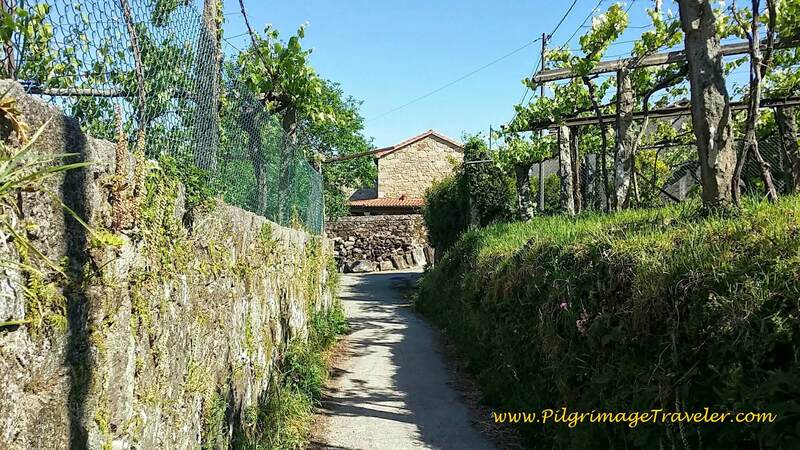 Over the next 3 km the Camino Portugués, on day twenty-four, meanders through quiet roads from where you leave the N-550 at the Iglesia Iria Flavia until in rejoins it at the Pension Residencia Pividal. 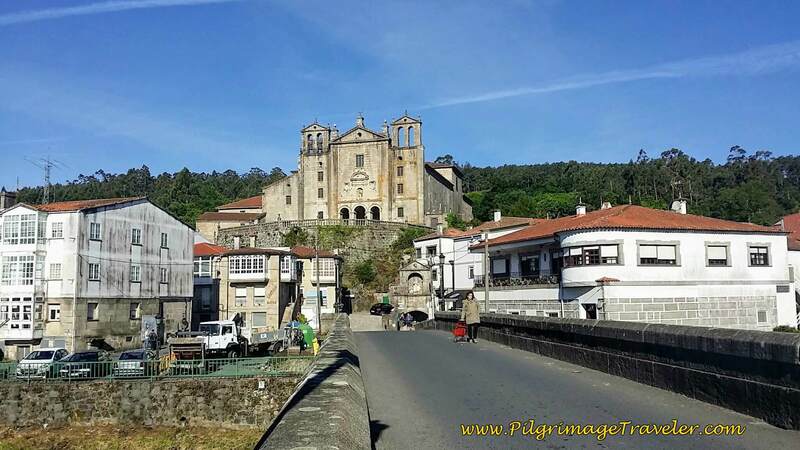 During these three kilometers, pass the Iria Flavia church, walk up the hill, make a bend around another church, the Igrexa de Santa María de Cruces, below, that comes into view as you climb. 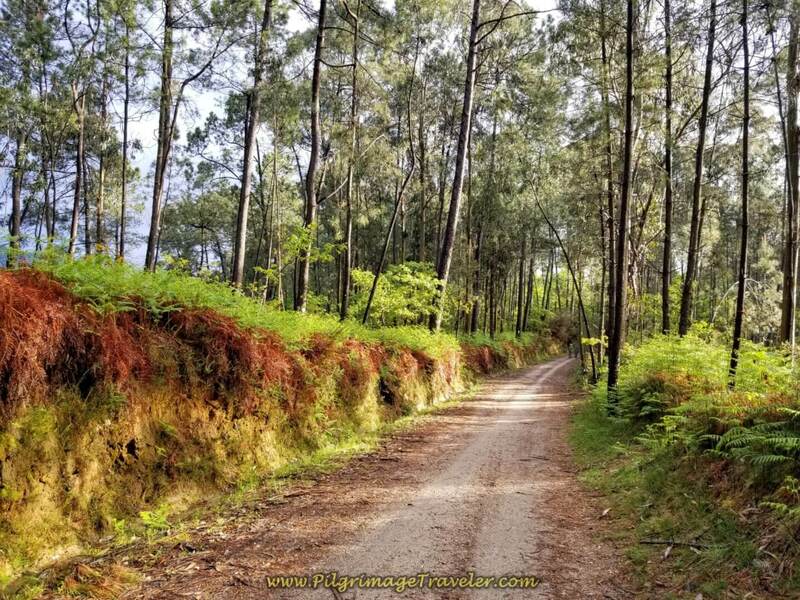 Continue walking on narrow, paved country roads, and later a dirt road leading you through the forest. Walk into the village of Picaraña, next, following unique yellow arrows, below. 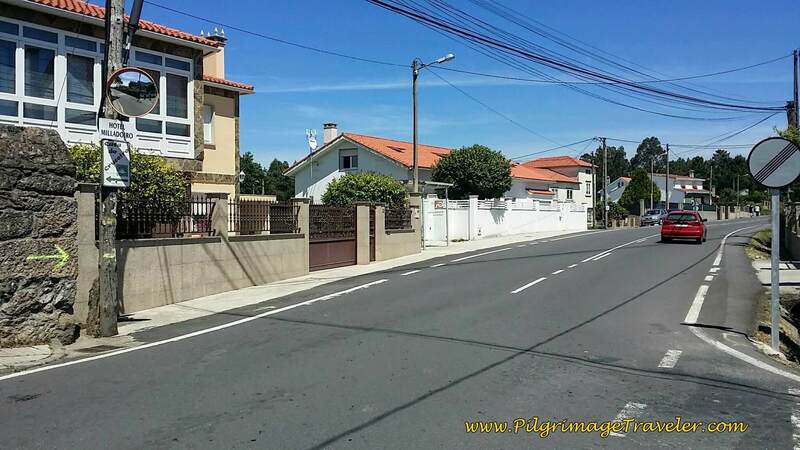 Here is the final stretch of pavement towards the Pension Residencia Pividal and the N-550. 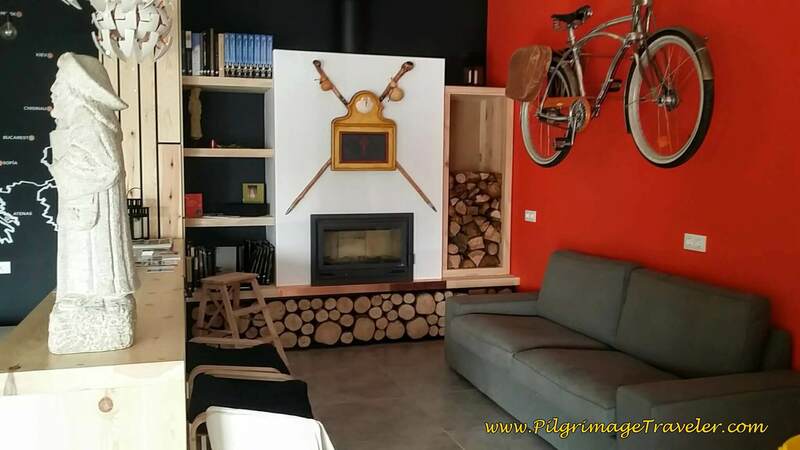 We stopped for another coffee break and lunch in Picaraña, at the Café Bar A Milagrosa, in the same building is the Pension Residencia Pividal. As we sat outside, we saw lots of pilgrims pass by. They must have been just behind us! If Picaraña is your destination for the day, click here for a list of hotels. After our lunch break, we started up again and faced a long uphill climb on the N-550. 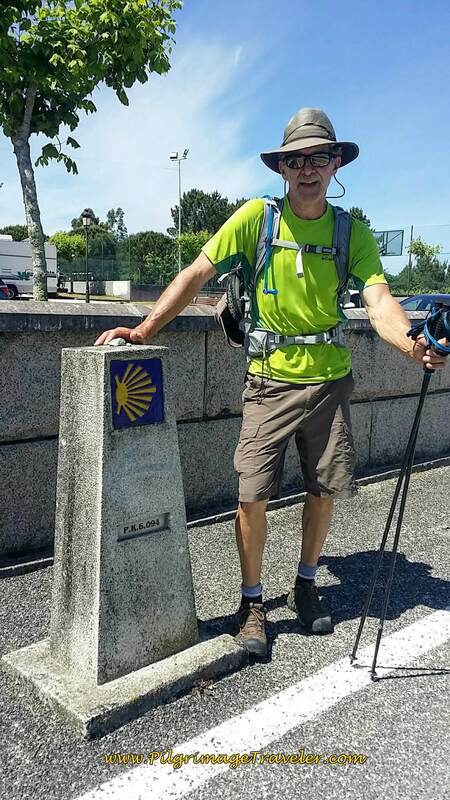 After 0.9 km, the Camino turns left, walking on a ramp that veers off before the big bend in the highway. 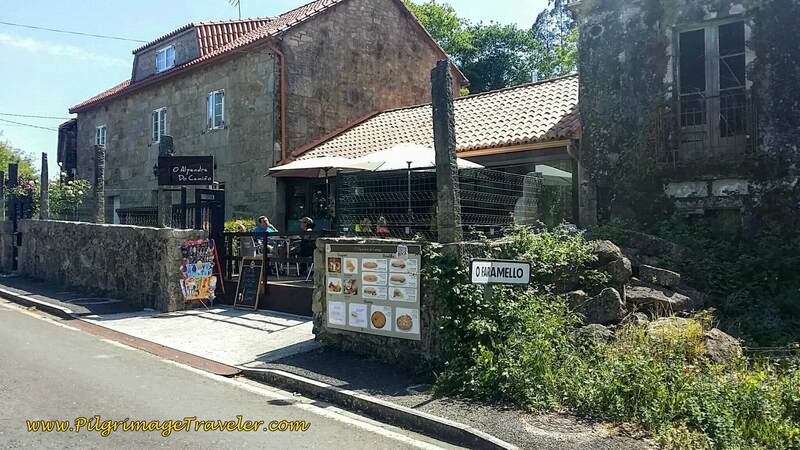 At the bottom of the entrance ramp, see this sign for the town of O Faramello at the café O Algandra do Camiño, pictured here. This looked like a quaint place to stop, better than along the highway, like we did! In about 300 more meters on this primary 2-lane road, we walked by the Albergue La Calabaza del Peregrino in town, of note, if you are ready to stop for the day. 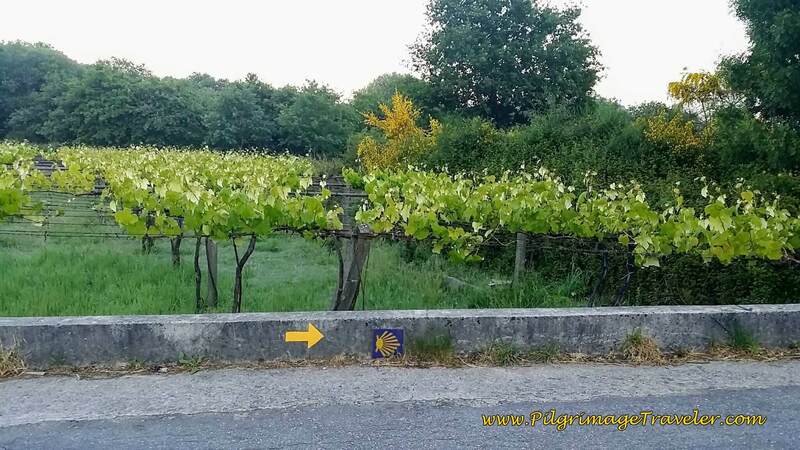 Leave O Faramello and in 0.7 km from the turn-off, turn left, dropping down a hill and onto a narrow side road. If you stay straight on this road, you will find the Albergue de Peregrinos de Teo in a few more meters - see my Google map. You will see the sign for the albergue. Continue walking on this country road for about 1/2 km, entering the next village of Teo, below. Come to a T and turn left on the Rúa de Francos. 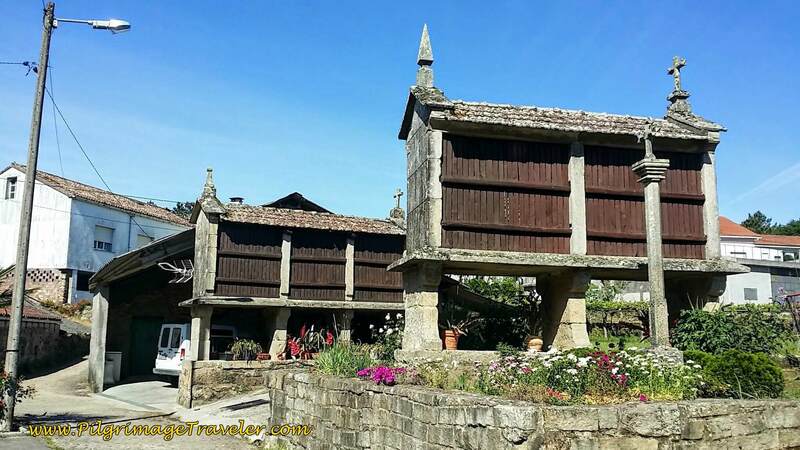 Bend around and pass the church, the Capela do San Martiño and turn left on the Aldea Beca for a few meters, then a right at a Y to walk by the Casa Rural Restaurante Parada de Francos. Another quaint-looking choice for accommodation in a restored farmhouse. It would be a lovely splurge if it is in your cards. 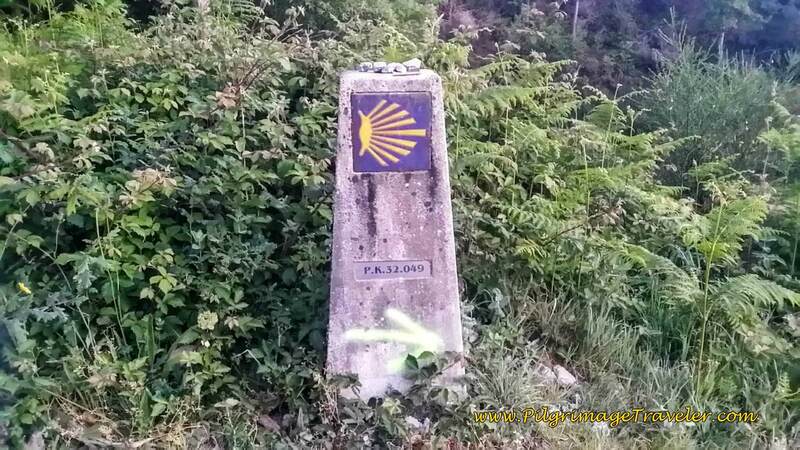 The Way continues for 300 meters north to the next intersection where you can see the 11.8 km waymark! Continue straight on and to the next intersection in another 300 meters. Again walk straight on another narrow country road through the countryside, gently but steadily climbing along the way. Come to a T-intersection in about another 300 meters, and turn right onto a paved road over a bridge to crossover the railroad tracks. 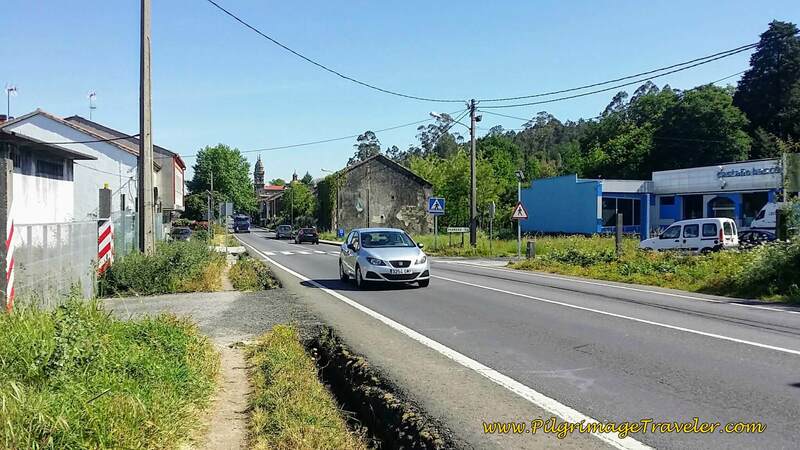 Stay straight on this road for about 280 meters and turn left on the Camiño Portugués. 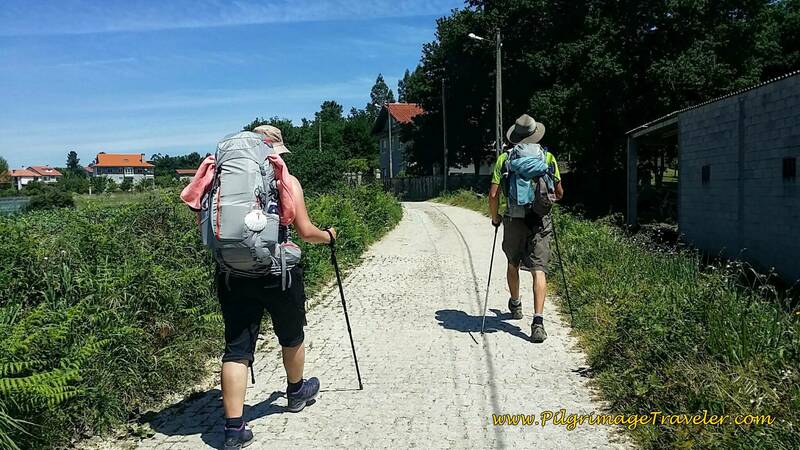 We ran into a fellow peregrina, Lisa, from Germany along this way, that we had met on the Coastal Route, way back in Caminha. It was a wonderful reunion to see her again! Her quiet and contemplative approach to life was welcome to my heart! 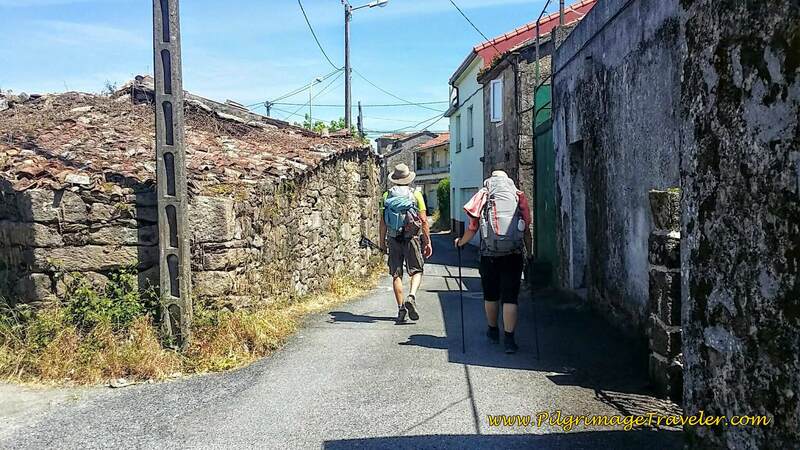 Here is Rich and Lisa walking on the Camiño Portugués. 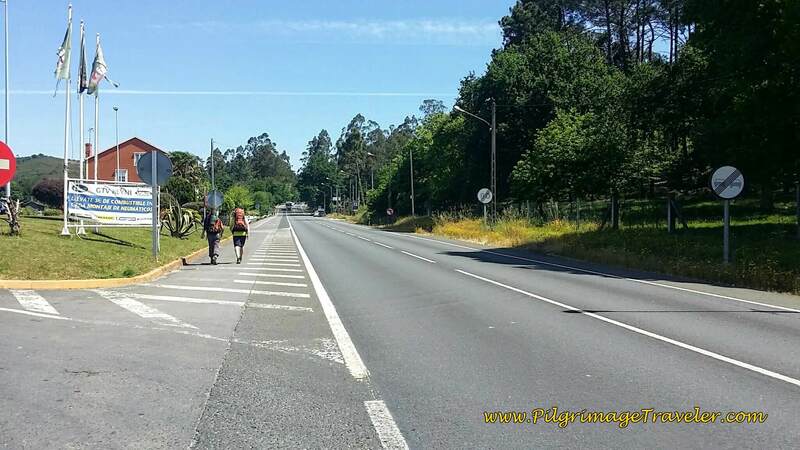 We all walked together on the Camiño Portugués for 270 meters, came to the intersection with the DP-0205, crossed over and went straight onto the Camiño de Riotinto. Here is the signpost to Riotinto, (Red River) the next town. I had Rich and Lisa pose by an attractive old building in the intersection, that was just waiting to be turned into an albergue! Who's in with us?? You can see it is for sale! Rich and Lisa at Signpost to Riotinto - Its For Sale! Walking 300 meters onward, we came to the bridge over the Río Tinto. At the end of the bridge is the 10.166 waymark! Wow, we are getting so much closer now. 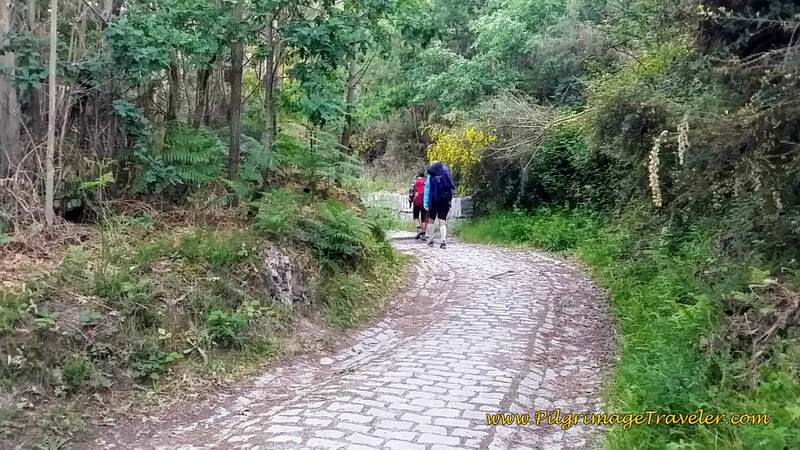 After the bridge, on day twenty-four of the Portuguese Way, the road becomes the Aldea Pedreira. The pilgrimage travelers came to an intersection, and went straight on, where the paved road is now dirt. 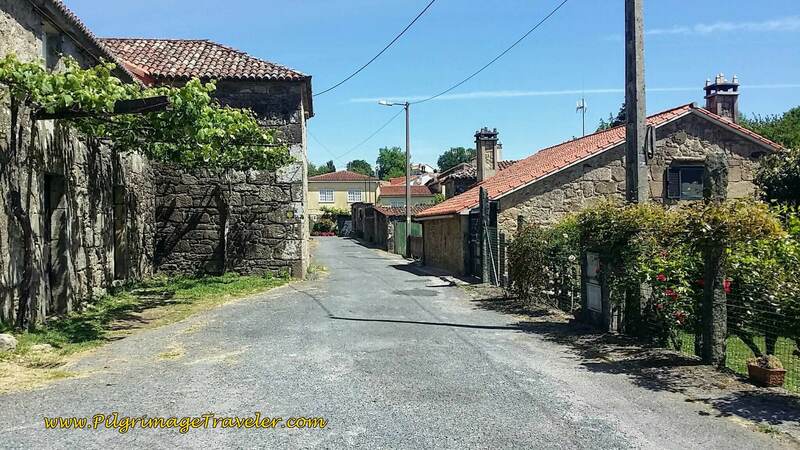 The Camino is still very rural here, following the Rio Tinto river valley, through fields and clusters of homes. Here is Lisa and Rich walking on a dirt section, that was very hot, dry and long. But I didn't complain! 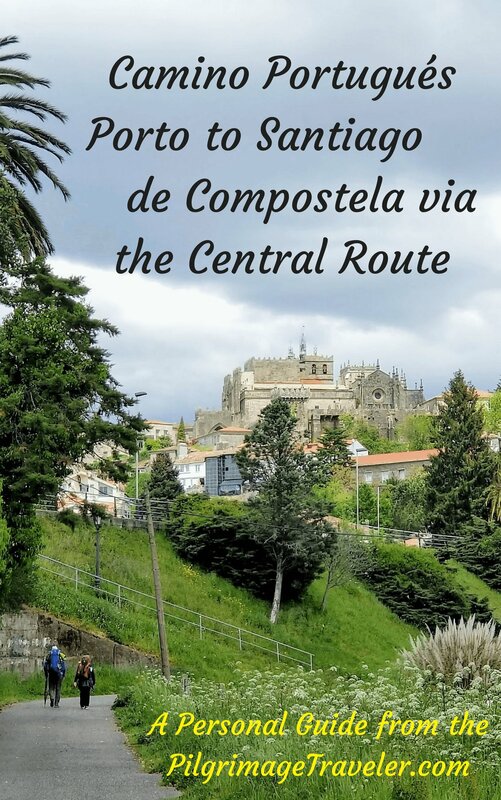 We were so close to Milladoiro, our destination for the day, and to Santiago de Compostela. I relaxed and fell into every step, knowing the pilgrimage was soon to be completed. 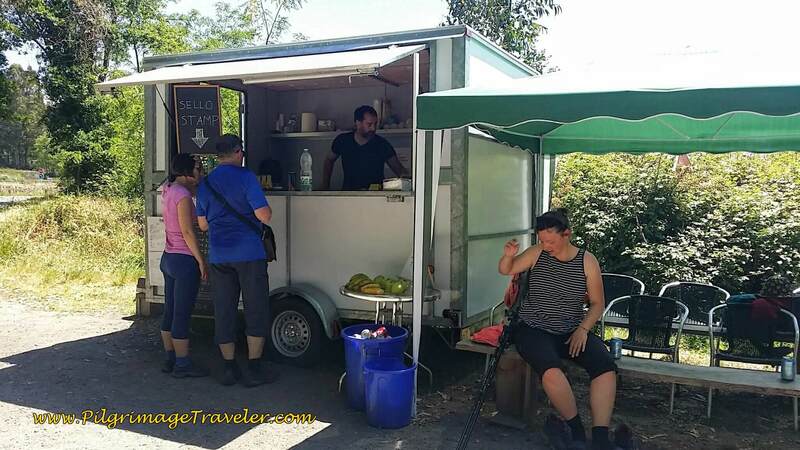 Through this long, hot and rural section, a local vendor had mercifully set up a refreshment stand. It was so welcome a reprieve to have a cold drink and some shade for a few minutes! Eventually the dirt road goes through a lovely and refreshing wooded area, crossing intersections, staying straight and eventually coming out to a frontage road by a large lumber mill. All-in-all it is a 2.83 km walk from where you cross the DP-0205 at the sign for Ríotinto, until the lumber mill. At the lumber yard the Camino bends around it, to walk through it and parallel to a busy highway, the AC-522 for about 200 meters. Or you can take the paved frontage road. They both come out at a large roundabout on the AC-522. 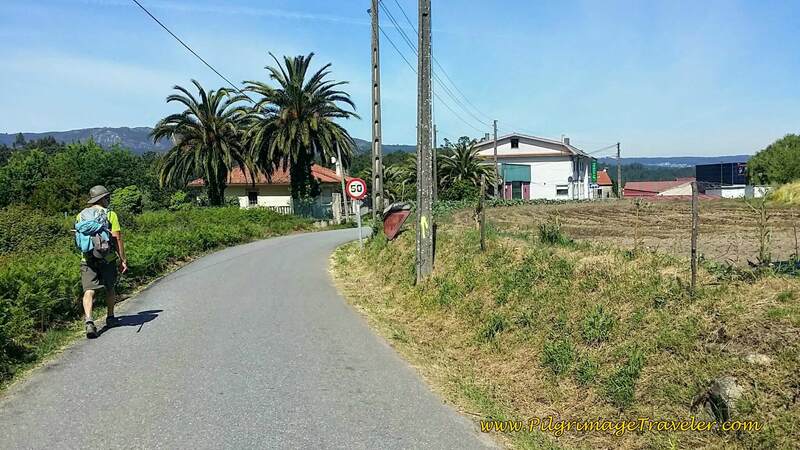 We crossed over the highway and walked back down the other side on a dirt frontage road for 30 meters, turning right on the Rúa do Redullo, now a rural paved road. In 350 meters you take the first left, walk 220 meters and turn right onto the DP-0206 toward Milladoiro. The intersection is shown in the photo below. Stay on the highway, walking carefully on the left side, climbing steadily up the long hill for 0.66 km more, approximately. 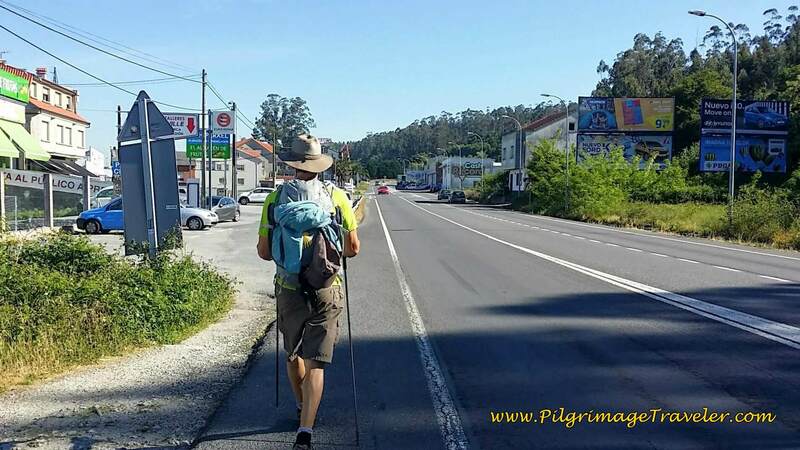 This is not a pleasant place to walk, but again, I didn't complain, but just kept walking, enjoying what few moments were left for me on day twenty-four of our Camino Portugués. Milladoiro is a brand-new city, ultra modern in every way. 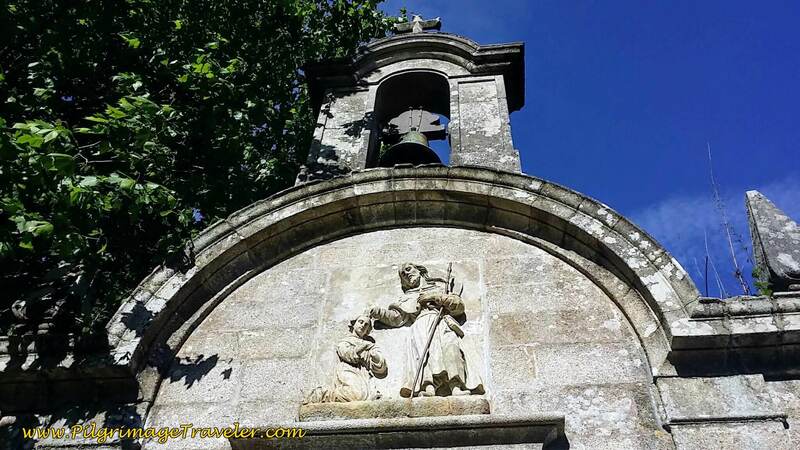 It really is a stark contrast to rest of Galicia with its ancient and hoary heritage! 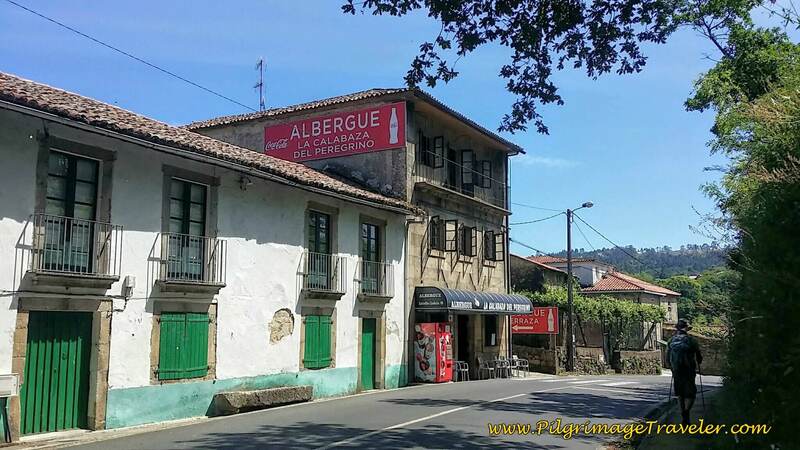 After only 400 meters more, along the Travesía do Porto, we saw the sign for the Albergue Milladoiro, our destination for the day. 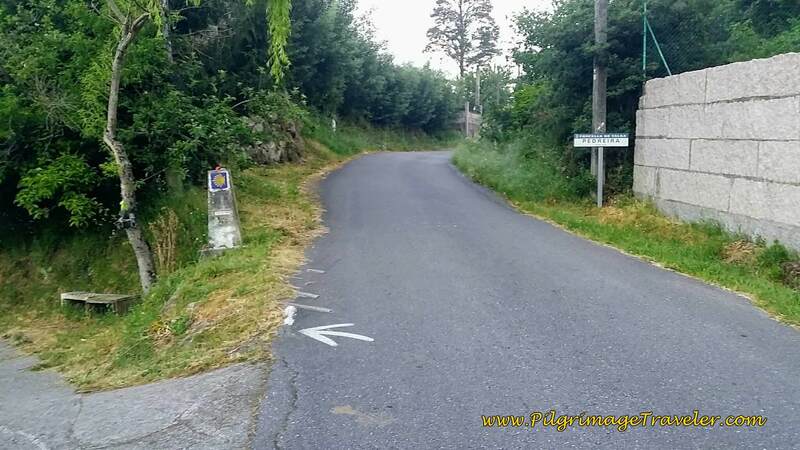 The Camino goes straight on, but we turned here on the Rúa Buxo to walk an additional 270 meters to the brand-new albergue. And indeed, the Albergue Milladoiro was lovely, accommodative and brand-new! 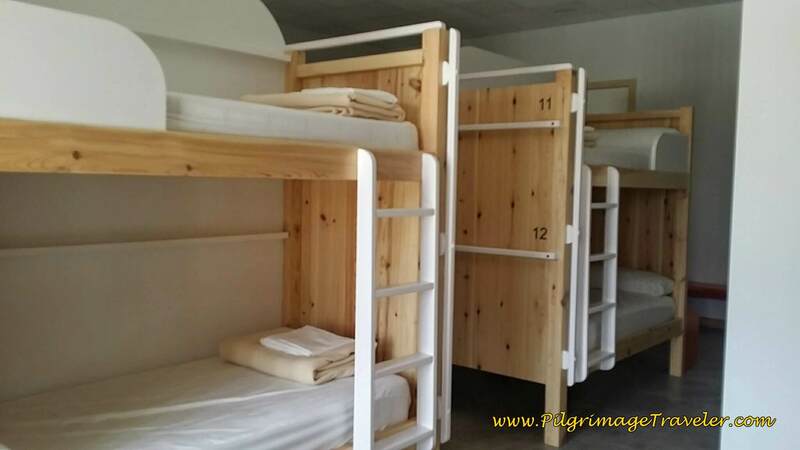 At 14 Euros, it is pricey for an albergue, but we thought it was worth it. Since it is relatively unknown, there were only a total of five pilgrims when we stayed here. I was the only female so I had the enormous, clean and private shower/bath to myself! 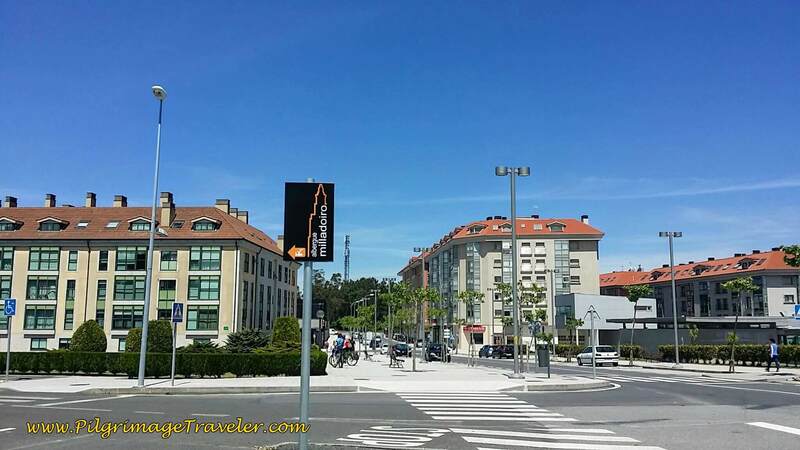 There are more Milladoiro hotels if this city is your destination for the day. Arriving here makes for a nice easy cruise into Santiago on your final day. 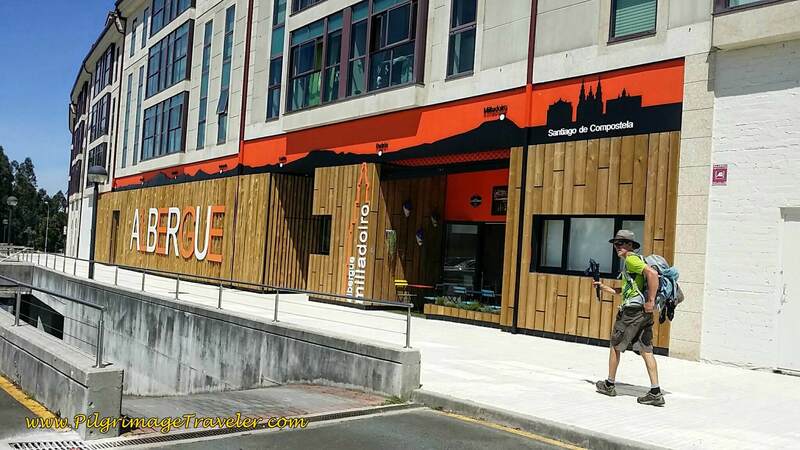 We arrived in Milladoiro at about 4 p.m. We saw that the neighboring café, the Cafetería Joy was not closed for siesta, so we took advantage of that fact to go immediately to it after checking in! We were hungry pilgrims! We ordered two beers and a full pie of tortilla (lovely potato and egg casserole shaped into a pie)! Ha, ha, we did not know what we were ordering. Rich, as usual, in his broken Spanish had asked for a "tortilla gigante" and the proprietress brought out the whole pie! We laughed and laughed and I said, wow, that is huge, in Spanish, and she smiled and said, take it away and eat more later, in Spanish. And indeed, this is just what we did. We saved 1/2 the pie for our breakfast in the albergue the next morning! It was just as delicious the next day! The Cafetería Joy brought us much joy on that wonderful Spanish afternoon. Needless to say, we found a lovely grocery store in the Centro Comercial, mere meters from the albergue, back on the Camino route, and had only a nice, but hearty salad for dinner. We shared our hearty salad with another young, somewhat aimless Swedish pilgrim, who did not know where his journey would take him next. I wished I could be as footloose and fancy-free as this young man, free of any of life's responsibilities, taking each step as it came. 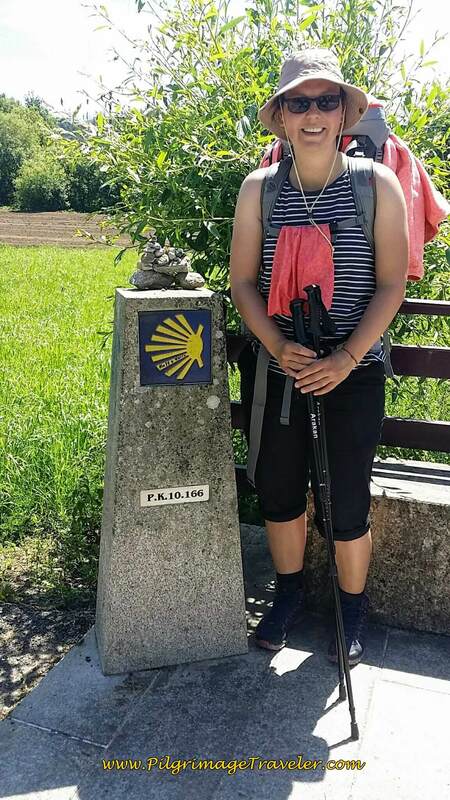 It seemed appropriate that we would meet this pilgrim on our final day before Santiago, when the boundaries between life and pilgrimage would become blurred. It forced Rich and I to ponder ~ what's next for us? We received a text from our English friend Steve. He had walked on to Santiago and would meet us there. He said the city was full of French pilgrims and we should book ahead. And so we did, with no problem at all. 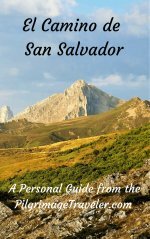 Here is a link to accommodations in Santiago. 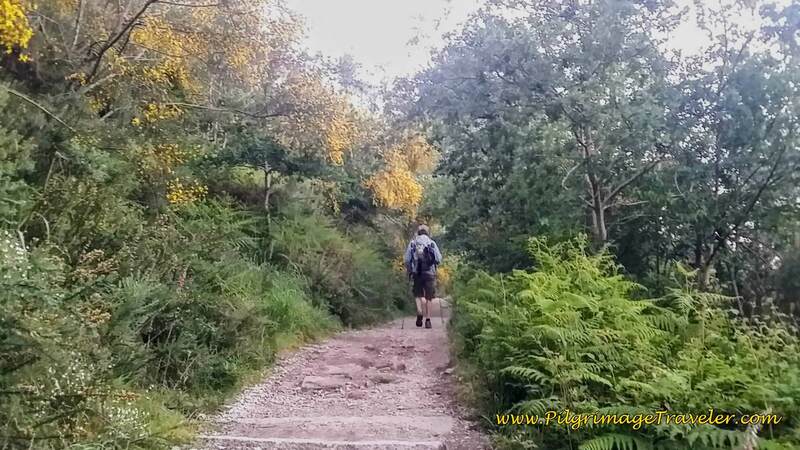 While we took our day at a slower pace than usual and walked out of the way climbing the Santiaguiño do Monte, stopped for longer breaks, relishing the moments, we would ask ourselves, now what? What comes next? 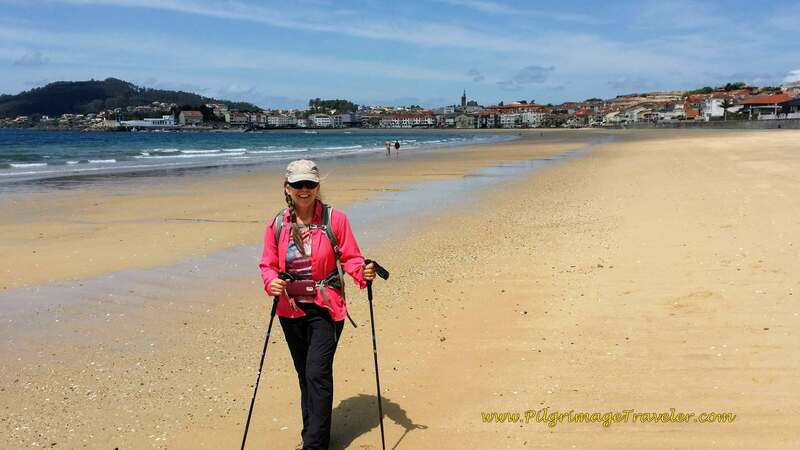 How will we face the upcoming days off the Camino? Can we keep things simple? 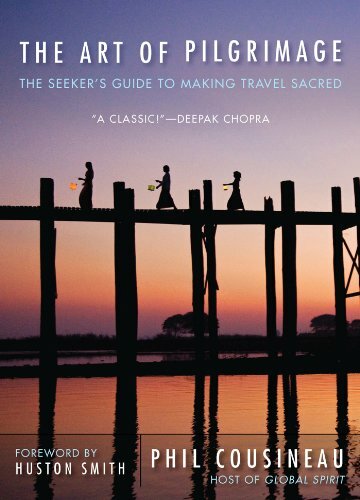 Can we honor the journey where we are? Can we rest within the Mystery as it slowly unfolds? 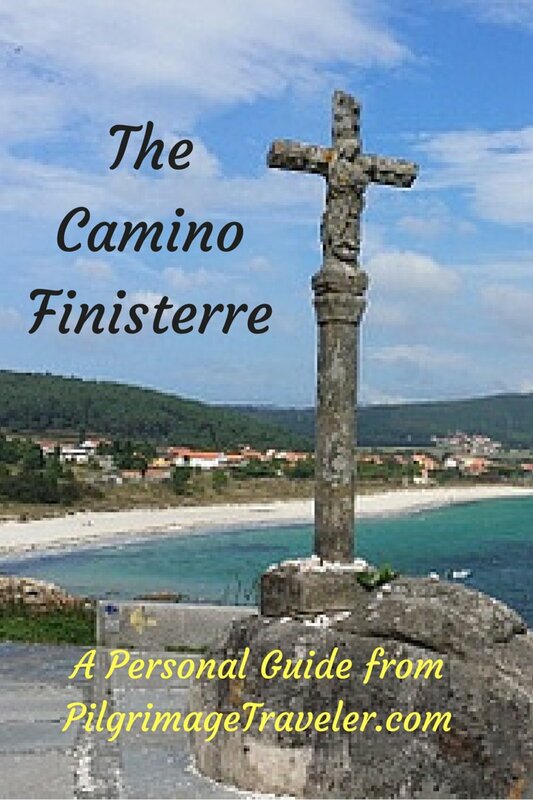 Most importantly, why didn't we treat every day on the Camino Portugués like day twenty-four? 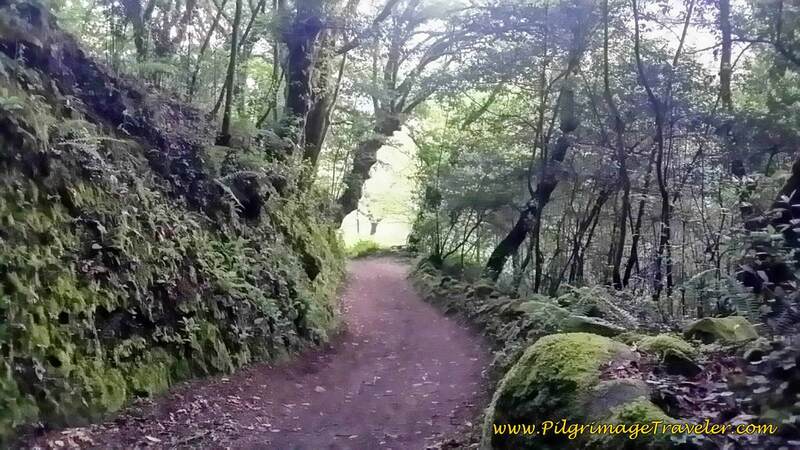 May your own day twenty-four on the Portuguese Camino be filled with the wondrous joy of the moment, the slow unfolding wonder and mystery as your walking journey and your life's journey merge into one!